Happy New Year and thank you for your continued support and friendship, it is truly appreciated. The next chapter in my Real Estate Career has begun and as of January 1, 2012, I am now affiliated with Keller Williams Realty as a Broker Associate. As my way of personally thanking you, I’d like to send you a 10% off coupon from Lowes Improvement Center good for any purchase up to $10,000. Send me an email to my new email address, Kathy@FreeFranklinSearch.com requesting the coupon and within 14 days you’ll receive it in the mail. If you do not have an email, call me 828-226-1074 and I’ll see that you receive one. 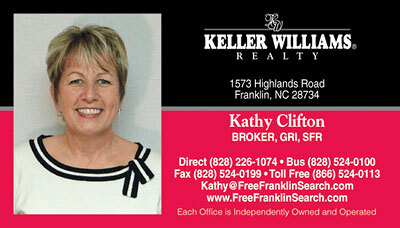 Home Sales in the Franklin and Otto, NC market are on the upswing. 332 homes were sold in 2011 as compared to 313 in 2010 with an average selling price of $126,782. Check out the Blog on my website for more detailed statistics and what we can expect for 2012. Best Wishes to you and your family. My new card is included with updated contact information.